Rona Dexler has had an infatuation with cars her whole life. From an early age, she frequently played with toy cars instead of dolls. This, in part, was because of her father’s passion for cars. As an automotive journalist, he’d definitely passed the car enthusiast gene on to her. Around the time she was graduating from high school, Dexler got the itch for a convertible. After her father reviewed that MX-5, another one ended up in their garage a few months later to review--a 1990 MX-5 in Mariner Blue and a #90 serial number. “My dad looked at it,” Dexler explained, “and he told me ‘You want this one.’"
Dexler and her father kept tabs on the vehicle. Once it hit its mileage limit for the manufacture press fleet, it would be sold to the public--and that was their chance. They found the car at a dealership and would end up owning the car for 18 years, until the vehicle was totaled in an accident. Dexler replaced her 1990 MX-5 with a 1991 MX-5 painted in that same regal Mariner Blue color. Not owning that car for more than three months, her brother took the car to work one night and the car was stolen. The itch for a convertible came back though. Dexler, unsure if she wanted an MX-5 again, toyed with the idea of buying something else but her friends and family reminded her how much she loved her MX-5. Over the years, Dexler has owned a few Mazda’s. 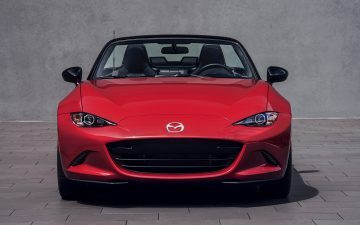 After owning a Protégé 5 for more than 15 years, she now owns a Mazda 3 and two MX-5s – a white 1991 awaiting some repairs and an Emerald Green Mica 2001. She’s also eyeing the new Mazda CX-5. Dexler currently serves as the president of the Southern California Miata Club that boasts more than 170 members throughout the region. Like most clubs, Dexler describes the club as being not just a community but more like a family.